Our bones, muscles and joints work together in a coordinated way to move our body and give it stability. Tendons and ligaments play an important role here, too: Tendons connect muscles to bones, allowing us to move, and ligaments help to hold things in place. What are ligaments, and what do they do? Ligaments are made out of connective tissue that has a lot of strong collagen fibers in it. They are found in different shapes and sizes in the body. Some look like pieces of string, others look like narrow or wide bands. 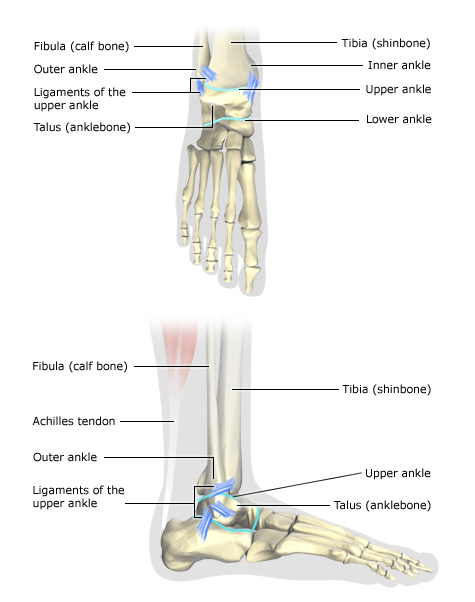 There are arch-shaped ligaments, too. Ligaments often connect two bones together, particularly in the joints: Like strong, firmly attached straps or ropes, they stabilize the joint or hold the ends of two bones together. This ensures that the bones in the joint don’t twist too much or move too far apart and become dislocated. But there are also some ligaments that aren’t connected to bones. For instance, some make sure that internal organs are kept in place. A typical example is the womb, which is kept in the right position in the pelvis by ligaments. Ligaments may also connect two or more organs to each other. For instance, the liver, intestine and stomach are held in place by ligaments in the abdominal cavity. These ligaments often have sensitive structures like blood vessels or gland ducts running through them. The strong connective tissue in the ligaments protects these structures and prevents them from bending, twisting or tearing.